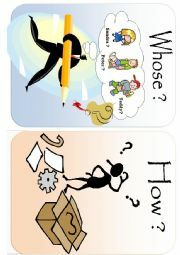 My second worksheet (multiple choice) on question words with different sentences and drawings. It can be used as a classe exercise or as a revision exercise. Hope you´ll like it! A simple worksheet used as a synthesis to help students study the words related to this theme. These are sentences so they have language functions: so they can make sentences. 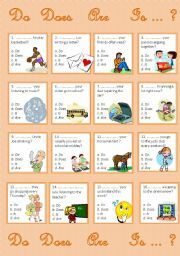 Last worksheet on the theme: question words. 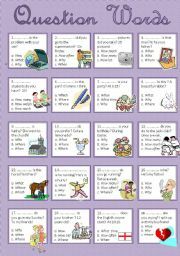 Other sentences, themes and pictures. Hope you´ll like it. 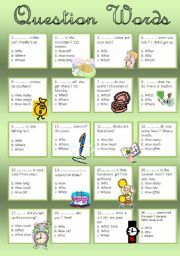 Next worksheets (multiple choice) on the present tenses. 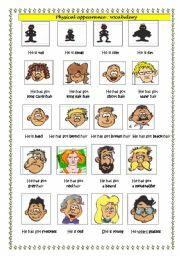 I saw that my last worksheets on questions words were often downloaded so I decided to create another ws about this theme. If it can help you, I´m really satisfied. Fully editable. After the synthesis, we can give this exercise to help students analize the good question word for each question by asking an explanation for each of their answers. 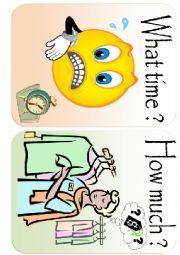 4 flashcards : Some nice flashcards to learn the question words. Easy to understand thanks to the pictures and good to use as a visual support. Here is my first set. It has been removed bu the administration bu tI don´t know why : there four flashcards as the rules ask. Thanks ! 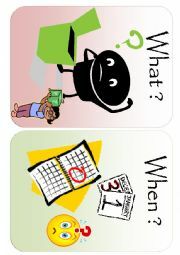 4 flashcards : Some nice flashcards to learn the question words. Easy to understand thanks to the pictures and good to use as a visual support. Here is my second set. It has been removed bu the administration bu tI don´t know why : there four flashcards as the rules ask. Thanks ! 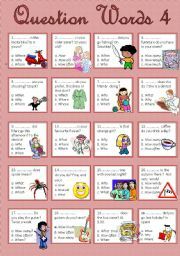 Some nice flashcards to learn the question words. Easy to understand thanks to the pictures and good to use as a visual support. Here is my fourth set. Thanks ! 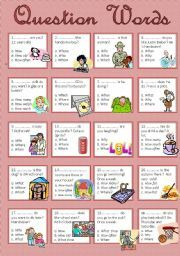 Some nice flashcards to learn the question words. Easy to understand thanks to the pictures and good to use as a visual support. Here is my fifth set. Thanks !